Today's recipe is the well known,simple caramel custard.Only difference is that I have added crushed walnuts to give a twist.Use cream instead of milk in this same recipe, then you will get the traditional Creme Brulee. Heat a pan .Add 2 tbsp Brown Sugar (or normal sugar is perfectly fine) and 2tsp water (we have to just wet the sugar with water). Sugar melts and starts bubbling; finally it turns to dark color. Pour this caramel into a pudding dish; I added some crushed walnuts into this caramel for a change. Beat 2 eggs +2 tbsp sugar+1 tsp vanilla+1 1/2cups milk. Strain it to avoid any lumps.Pour this custard into the pudding dish in which we have already added caramel.Cover the pudding dish with aluminium foil. We have to double boil this custard now. For double boiling the custard, take a big pan with lid. Boil water in this big pan and keep the smaller pudding dish inside and close the lid. Water level in the big pan should only reach the half of the pudding dish. Let the water boil for 15-20 minutes on medium heat. Custard will get cooked slowly. Now refrigerate it for at least ½ an hour. At the time of serving, scrape the edges of the custard and carefully place a serving plate to close the custard mould .Now turn it upside down very slowly. 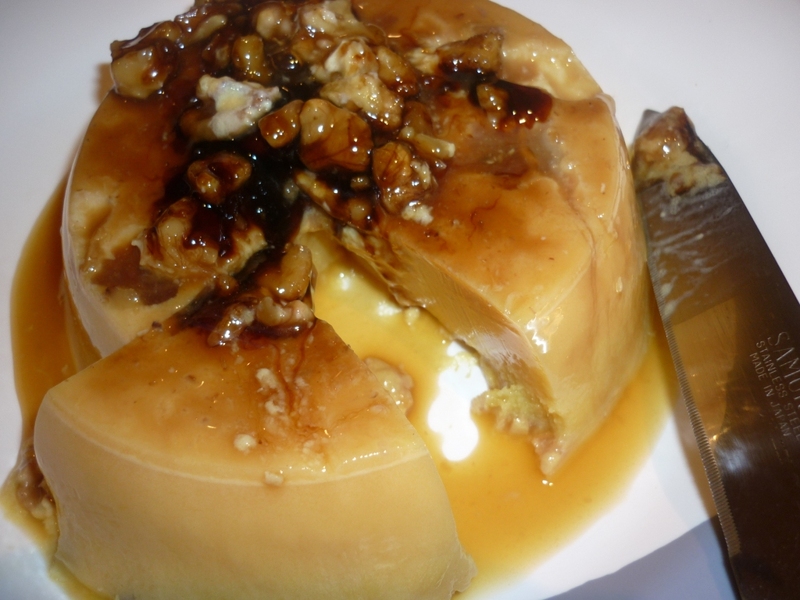 You will get beautifully decorated custard ,bathing in caramel syrup!!!!Enjoy! Truly heavenly good n delish done.Fab pudding. wow this is so yummy...Never attempted this at home...Tempting me dear. Caramel custard looks simply superb. Tempting dish.